Do you want to enjoy a Home Theatre experience in the comfort of your home? Buying the best projector less than 1000 in 2019 can make this possible. The colors might not be as perfect as a 4K TV, but the image remains crystal clear. With the models reviewed here, you cannot go wrong when choosing one of the models displayed here. The good news is your TV needs to remain in one position but with the projector, you can easily move it from one room to another. Another excellent reason is that you can turn your family room into a small cinema for all to enjoy. Take pleasure in viewing movies on your own big screen as the size is limited to the extent of the wall. So what do you need? You need a dark room with a screen and one of the projectors under 1000 reviewed here. We have picked some of best models with a great contrast ratio, brightness, and loads of input and output support. Therefore, without keeping you any longer let us get on with choosing one for your home, office, or apartment. Enjoying movies at home has never been easier. 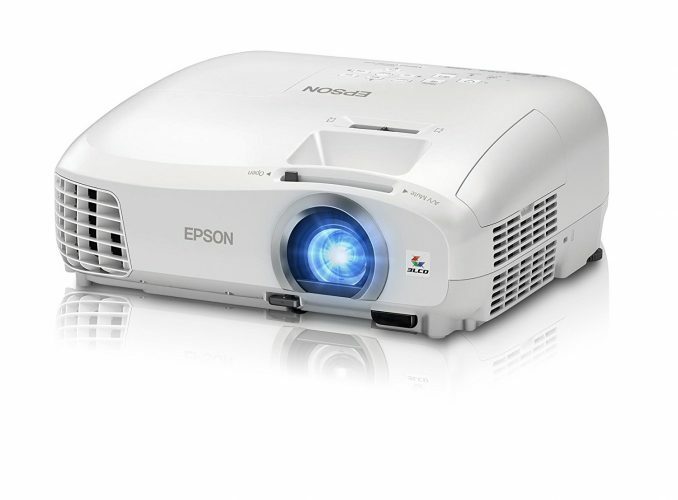 With the Epson VS250 Projector, you can have the best entertainment right there in the home. The VS250 offers you a more accurate picture with vivid colors even when the lights are on. To make this possible the unit has 3,200 lumens of equal colors and white brightness included. The SVGA resolutions 800 x 600 and is perfect for projecting movies, graphics, and presentations every day. You will have the Epson up and running in no time, as the image adjustments are easy to use and control. The device has remarkable color accuracy with up to three times Higher Color Brightness and a Wider Color Gamut compared to DLP projectors. The device is portable and lightweight weighing 5.3 lbs and measures 11.9 (W) x 9.2 (D) x 3.2-inches (H). The button controls on the top of the unit and has a black front nameplate. The Epson VS250 project comes highly recommended by different users. The great thing is the device is ready to use out of the box. Enjoy viewing movies with a 15 ft wide viewing experience right there on the wall. Enjoy streaming HD content and bring movies to life for all to enjoy. With the ViewSonic PJD5555W HDMI projector, you can enjoy a resolution of 1280 x 800 while watching movies in your home. The device has 3300 lumens with a dynamic contrast ratio of 20,000:1. Set it up 12-feet away from a wall and view images on a 110-inch screen or 270-inch screen from 30-feet away. This makes the projector perfect for conference rooms as well. The projector has vertical keystone with a vast selection of inputs with exclusive audiovisual features. When using the device in Eco mode you get up to 8000 lamp hours and with the 2W built-in speaker, optical focus, and zoom, with a cable management hood. You will have the device set up in no time. Has 5 view settings and includes a power cable, Remote Control, batteries, Startup Guide, VGA cable, ViewSonic Wizard CD, and a three-year warranty. If you want to enjoy the best entertainment at home from different media devices, the ViewSonic PJD5555W is one of the best projectors available under $1000. Use your iPhone, PC, DVD and more connected to the unit and view 3D images directly onto the wall. The great thing is the image quality is perfect in both bright to dark environments to use. Enjoy Miracast, YouTube, Netflix, and Airplay when you buy the WOWOTO T8E Multimedia Projector. The unit offers you a 50% brighter and sharper image. 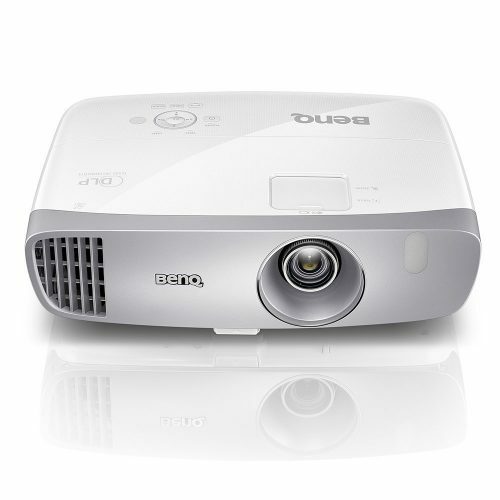 The projector comprises DLP Technology with a native resolution of 1280 x 800. Compared to our other brands this one offers you 2000 lumens with 3D technology and supports 1080P. The maximum size is up to 300-inches. With the multi-function, you can connect different devices from your Android 4.4 system to Game consoles with the wireless connectivity. You get Hotpost with a touchscreen control and the device is portable enough to take with you anywhere. The good news is it is perfect for tailgate parties as it has a built-in 7800 mAh rechargeable battery. The T8E measure 7.8 (L) x 4.8 (W) x 1.5-inches (D). The WOWOTO Smart Projector is suitable to use indoors and outdoors. The device makes for an outstanding centerpiece in the home offering you the best entertainment anywhere. The units made with multiple inputs, built-in speakers and you can control the screen via any mobile device. If you need the best projector less than 1000, the Optoma HD 3D DLP Projectors price and features will please you. The screen size range is 66-inches to 107-inches depending on how far you use it from the wall. With a 3000 ANSI lumens brightness and 23,000-contrast ratio, you can enjoy watching movies at home. This is a next-generation entertainment system to watch 1920 x 1080 full HD movies. With the reference display mode and sRGB, you get accurate colors with a clear display. The lamp has a life expectancy of 8-hours and the REC 709 color space gives you a brighter color with enhanced movie quality picture. Enjoy the surround sound as if you are in the cinema with the built-in 10W speakers. Connect different devices via the HDMI, Audio Out, USB, and 3D-Sync. The projector measures 9 x 11.7 x 3.7-inches and weighs 5.5 pounds. The Optoma HD142X offers you a good image with a full HD resolution and solid contrast. When viewing images the colors accurate and it is one of the least expensive devices available. You will not be disappointed when you buy this projector, as it is lightweight and easy to set-up. With the BenQ DLP HD W1070 projector, you can create your living space into a perfect home theatre. Enjoy viewing full HD 1080p image projection in the comfort of your room with a projection of up to 200-inches. With the DarkChip3 DLP Technology, the image quality is more than perfect. The projector gives you a contrast ratio of 10000:1 and offers you 2000-lumen brightness. The sound will blow you away as it has built-in speakers. The good news is this device is perfect to use at home and the office. With the DLP Technology, it combines up to six different colors and equipped with colorific system to deliver three times more contrast. You can even use with HDMI devices connected. Enjoy your Blu-Ray movies or connect your gaming console for a night of gaming with friends. The units easy to set up and are one of the world’s leading SmartEco systems when used in Eco mode. A standout feature is that the projector automatically switches to the Eco Blank Mode once turned on. If you want a good picture with a great price, the BenQ W1070 offers you all of this in one great package. The black levels are great and you get excellent color accuracy. Even the 3D playbacks perfect. The only downside is you will have to buy the 3D glasses separate. 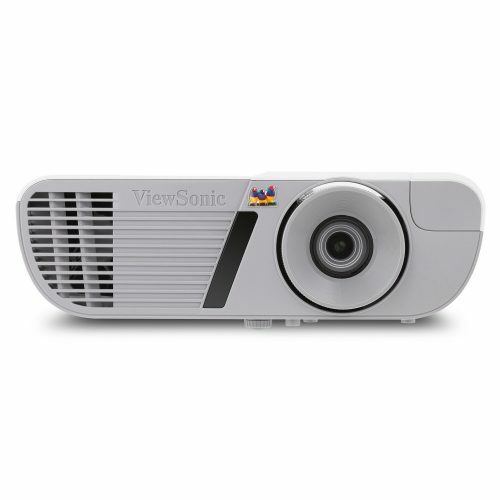 Here we have another affordable projector for less than a $1000 the ViewSonic PJD7828HDL model. As with the other ViewSonic model reviewed here this one also has the 3D DLP DarkChip3 Technology for the best audiovisual experience. The LightStream projector is perfect for home entertainment and has a 3200 lumens lamp offering you 1920 x 1080 resolutions in Full HD. The design is user-friendly and has a stylish compact white chassis. For a wide color gamut, it uses SuperColor Technology and great to use in any environment. The projectors packed with 10W speakers for incredible sound bringing you the cinema experience into your home. The HDMI/MHL connection compartments enclosed to keep wires neatly stored away. A major standout is the support of HDMI dongles to connect wireless devices. The device does have shorter throw ratio with 1.3x optical zoom and a smart design providing you quick set-up anywhere. If you want to immerge yourself into a movie at home the ViewSonic PJD7828HDL is ideal. You will get a great image quality with full HD resolution and a solid contrast. The units suitable for small spaces and offers you a huge image. The Optima HD27 3D DLP Projector has a screen size range of 71-inches to 107-inches with a throw ratio of 3 1.48 to 1.62:1. The brightness is 3200 ANSI Lumens with a contrast ratio of 25,000:1 and has keystone correction. Connect different devices via the HDMI, 3D VESA Sync port, Audio out, 12V Trigger and USB-A ports. You can easily turn your home into a private cinema as the projector has a brilliant color using REC.709 technology. View Full HD 1080P content as it projects 1920 x 1080p that is perfect for watching Blu-Ray movies without the need of downscaling. Enjoy hours of entertainment as the lam life is up to 8,000 hours and the surround sound will blow you away. The HD27 has built-in 10W speakers for clear sound. Use the reference display mode or sRGB color profile to align colors conforming to HDTV content. Want to enjoy 3D movies this is possible with this projector and has a rapid refresh rate of 144Hz. You can stream games and movies directly onto your big screen using the MHL v1.2 connectivity. If you want to enjoy watching 3D content during the day or night, the Optima HD27 is a supreme projector. The audio is perfect with the built-in speakers and the zoom places the image where needed for the best viewing experience. Furthermore, this is one of the quietest projectors with an affordable price for you to buy. The 2040 projector is another invention from Epson and is one of the best home cinema projectors available at a great price. Enjoy 1080p Full HD content with three times higher color brightness. 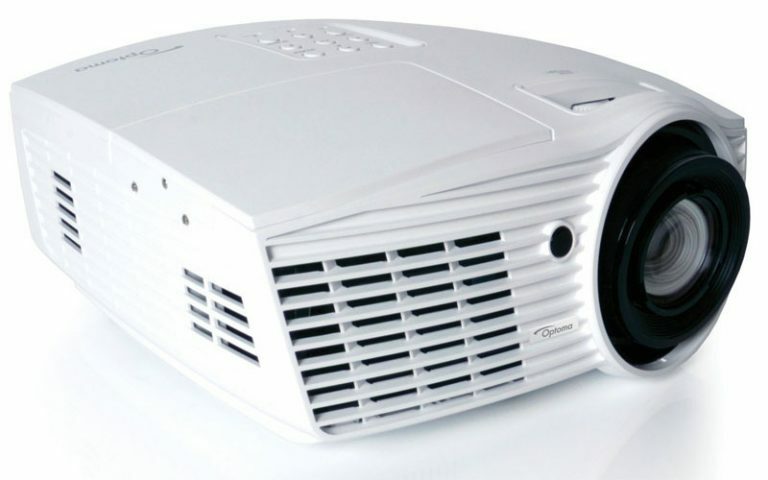 The 3LC D projector offers you a 2200 lumens color brightness and white brightness. There are two HDMI ports with MHL connectivity to enjoy playing games, watching movies and more. Project up to 300-inches anywhere and connect your Blu-Ray or streaming devices. Bring the best surround sound into your room with the built-in speaker and set up the unit with the convenient tools. View content from 8 to 12 feet away and watch movies on a 90 to a 134-inch screen. The device measures 11.69-inches wide and has a depth of 9.65-inches while standing 4.69-inches high without the feet. The contrast ratios 35,000:1 and has keystone correction. When used in Eco mode you get up to 7,500-hours lamp use and in normal mode, you can reach up to 4000-hours of use. If you want an inexpensive projector, the Epson 2040 is the one to buy. Included you receive free rainbow artifacts with frame interpolation for smooth motion. The image quality is perfect for both 2D and 3D viewing with a short time lag that is great for gaming. 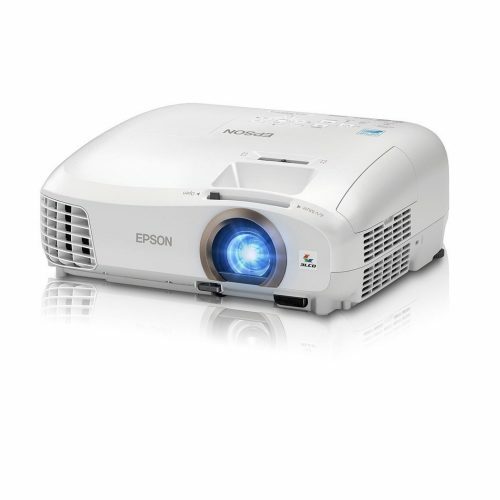 Another projector available from Epson is the wireless 2045 model. You can watch full HD 1080p content in your home from different connected devices. Benefit from the three times higher color brightness compared to other models. The images are vibrant and packed with HDMI and MHL ports to stream content wirelessly. The color brightness is 2200 lumens and the white brightness is 2000 lumens. Display content anywhere for a display of 300-inches making it perfect as a home theatre system. The focal length is 16.9 to 20.28mm and has a manual zoom ratio of 1.0 – 1.2. With the new design and easy setup of the Epson 2045, you will have friend and family over for the best entertainment in no time. The dynamic contrast is 35,000:1 and you can stream content directly from your Blu-Ray, Intel WiDi, or Miracast. For the best image quality, the Epson 2045 projector brings you an amazing home cinema experience. Enjoy full HD content with accurate colors and connect your Smartphone for the best viewing at home. The projectors equipped well and perfect for you if you are sensitive to DLP rainbows. Take pleasure in the best home theatre experience with the BenQ HT3050 projector. You can benefit from the best cinematic experience as the HT3050 offers you a perfect color palette with a 15,000:1 contrast ratio. On your big screen, you get a short throw projection of 100-inches from 8.4-feet and great for smaller spaces to use. The diagonal screen size is 60 to 180-inches with a 1.3x zoom while the vertical lens shift has a throw ratio of 1.15 to 1.5. The projector runs quietly with the low fan noise and it is energy efficient with the SmartEco mode. When used in this mode you get up to 7,000-hours of lamp life use. The Rec. 709 calibration offers you the best image quality to enjoy a movie in the comfort of your home. The CinematicColor technology gives you optimal color and enhances the image for the best home theatre experience without leaving the home. While the CinemaMaster Audio+ Enhancer turns your room into a movie theater for all to enjoy. The units packed with 20W stereo speakers housed in booming sound chambers and used in Hollywood studios for the best surround sound. 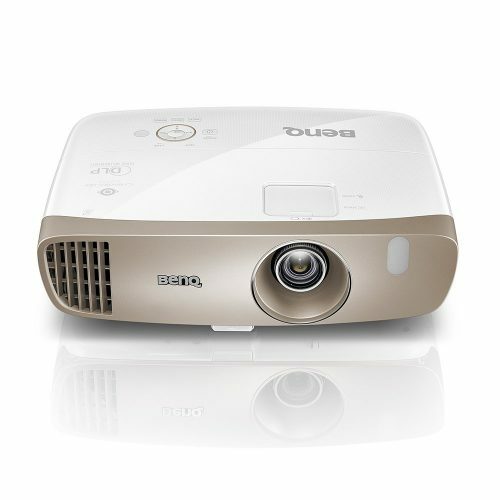 If you need to view full 1080p resolution in 2D and 3D with 1.3x zoom, the BenQ HT3050 projectors more than sufficient to use. The model has a modest vertical lens shift and a capable sound system to enjoy a private movie experience at home. Enjoy your own cinema experience with a projector setup in the home. 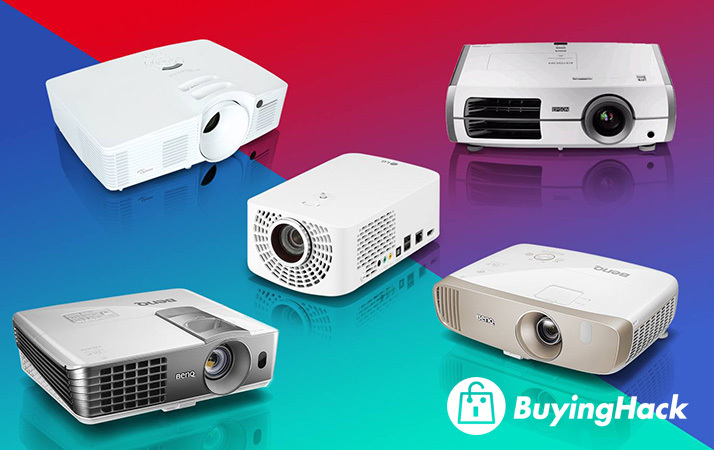 We hope that our list of the best projectors under 1000 in 2019 helps you to find one best suited for your viewing needs. Whether you need one for the office or home each of these models will fit in with your large to small space. 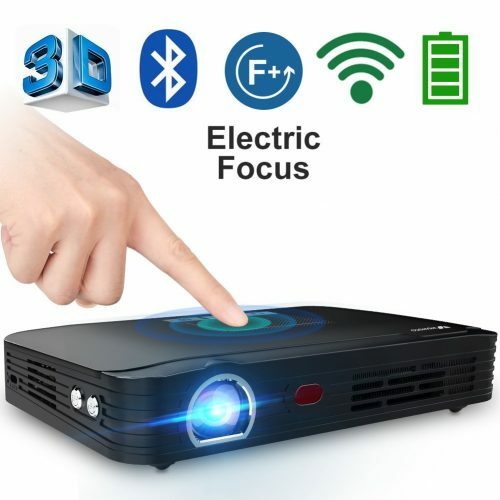 10 Best Pico Projector in 2019. Reviews Of The Best Small TVs in 2019 .